29 March 2011: There is a large ridge building across the Rockies this week but a trough is passing through the area on Sunday. At the moment the models have the low turn southward as it departs the Rockies. If the model runs hold through this week, we could have snowfall Sunday night through Monday mid-morning. 12 March 2011: THE BEST WINDOW FOR SNOW APPEARS TO BE WEDNESDAY NIGHT INTO THURSDAY MORNING. WEDNESDAY MAY BE THE WARMEST DAY OF THE WEEK...WITH A COOL FRONT POSSIBLY ON THURSDAY. 6 March 2011 (John LHeureux NCSU): There is an east-northeast windflow at the surface (induced by a surface high being caused by slight convergence in the upper level to the northeast of the study area). The east to northeast (and ultimately northerly) wind flow will start just after midnight tonight and temperatures will fall throughout the night. Monday day the northeast wind flow will become slightly enhanced and will keep the surface layer cool. Although there will be competition between the southerly airflow and the northeast wind flow, the colder advection will completely overwhelm the warmer air by Monday mid-morning. This is supporting colder temperatures being available at the surface by the time the moisture arrives Monday afternoon. Light snow showers are being favored at the moment for the area Monday afternoon, with heavier snowfall arriving Monday evening into Monday night and extending until Tuesday morning. The system itself is hooking to the south-southeast upon reaching the Plains. This will keep the light to moderate snow showers into the region through Tuesday morning and afternoon. 4 March 2011 - Outlook early week (John LHeureux NCSU): Sunday night's event is moving away too quickly and the moisture flow is too weak at this point. This would not be an ideal event but Tuesday afternoon through Tuesday night is looking very ideal. A large trough is building across the Rockies next week. Starting Monday night, temperatures will drop to below freezing for Boulder, Colorado but will surge above freezing once again Monday. What I am seeing for Tuesday is a rich moisture flow with an ideal temperature range. I like seeing the trough amplitude increasing during Monday (both the EURO and the GFS). The low forming in conjunction with this trough will establish its identity sooner (Monday evening) and will signific antly strengthen once reaching the eastern Rockies. Although the EURO and the GFS both have a similar handling for the intensity of this low, I am leaning towards the slower propagation of the low as shown in the EURO. Tuesday early afternoon (1PM) through Tuesday night is looking ideal for a moderate snow event. 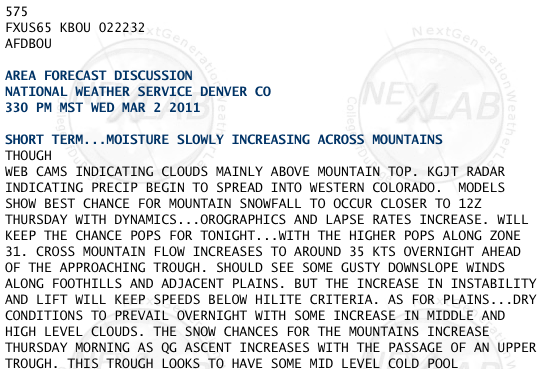 2 March 2011 - Outlook next week (330pm NWS): THE NEXT STORM WILL MOVE ACROSS THE AREA LATE SUNDAY AND SUNDAYNIGHT. ONCE AGAIN IT WILL BE QUITE PROGRESSIVE SO ONLY LIGHT AMOUNTS OF SNOW ARE EXPECTED IN THE MOUNTAINS. THE THIRD STORM LOOKS LIKE IT MIGHT HAVE A CHANCE TO BE THE MOST SIGNIFICANT OF THE STORMS. IF THIS SYSTEM WERE TO SLOW DOWN A BIT AND BEGIN DRAWING IN A BIT MORE MOISTURE...THEN FURTHER DEVELOPMENT OF THE SYSTEM WILL BE POSSIBLE. 1 March 2011 - Outlook for Friday 4th :There is a moderate chance of snowfall happening after 1AM Friday morning of this week. This will not be a heavy snow burst but will be a weak to moderate snow event. A shortwave trough is moving through the area on Thursday. A lee cyclone is forming east of the area late Thursday night and early Friday morning. The precipitation will start as RAIN for Boulder on Thursday with the rain/snow line being fairly high up. The rain/snow line will decrease in height Thursday night with the change from RAIN to SNOW happening after midnight (I am thinking 1AM at this point). Winds will be from the NNW Thursday night into Friday morning. The precipitation will change back to RAIN mid morning Friday (temperatures are currently hovering just below freezing for that night). Friday night will have colder temperatures than Thursday night and will be all SNOW around 10PM. John L'Heureux (Grad student NCSU).